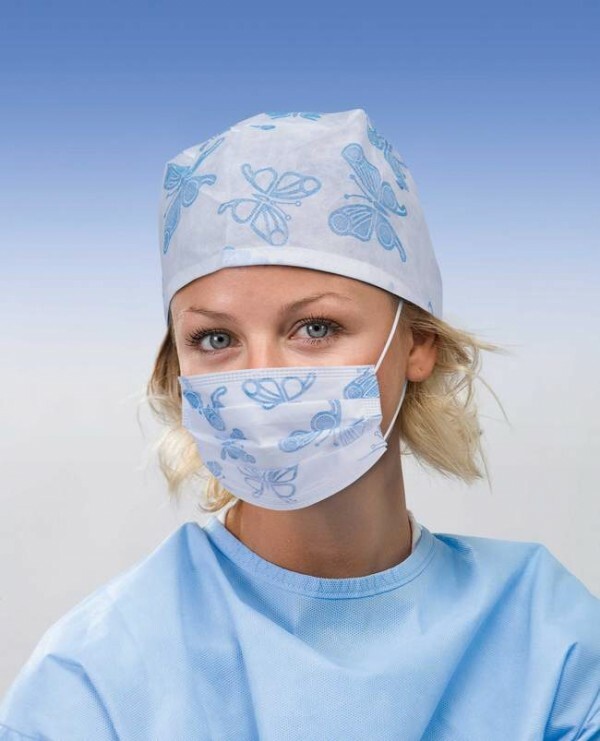 Protection and comfort are the distinguishing features of Spiritus Plus® surgical face masks. Each three-layer, non-woven fabric mask is fluid-resistant and available with strings or round anallergic elasticized ear loops and optional splashguard visor. Layers are sealed on one side through an ultrasound procedure that prevents bacteria migration. Furthermore, the hypoallergenic and glass-fiber-free non-woven fabric (NWF) ensures a high bacterial filtration efficiency (BFE) with a low breathing resistance (Δ P). The adaptable nose bar covers the entire length of the face mask. Spiritus Plus® surgical face masks comply with the EN 14683:2005 European standards for the manufacture, performance and test methods for surgical face masks in order to limit the transmission of infectious agents between patients and clinical staff during surgical operations. Class: IIR; BFE: 98%; Splash Resistant < 120 mmHg ; Delta P < 5.0 mm HO/cm2 How to use a Facemask: 1. Fully unfold the mask to cover both the mouth and nose. Pre-form the nose bridge and put it on the middle of the nose. 2. Place the upper tie-band on the middle of back of the head. 3. Place the lower tie-band on the upper back of the head. 4. Always fully unfold the mask to minimize the number of layers you have to breathe through. 5. Change your mask when you notice fluid strikethrough as well as between operations. 6. Throw away the face mask when not working in the operatory.